Conor Mullen Oberst (born February 15, 1980) is an American singer-songwriter best known for his work in Bright Eyes. He has also played in several other bands, including Desaparecidos, The Faint (previously named Norman Bailer), Commander Venus, Park Ave., Conor Oberst and the Mystic Valley Band, and Monsters of Folk. Oberst was named the Best Songwriter of 2008 by Rolling Stone magazine. Conor Mullen Oberst was born on February 15, 1980, as the youngest in a family of three boys, and raised in Omaha, Nebraska, to Matthew Ryan Oberst, Sr., an information manager for Mutual of Omaha, and Nancy Oberst, an elementary education director for Omaha Public Schools. Oberst has two elder brothers. Matthew Ryan Oberst, Jr. was a teacher and part-time musician, who helped finance one of Oberst's self-released independent albums. Matthew was also in the indie band Sorry About Dresden, which Conor played in from time to time. Justin H. Oberst is a graduate of the University of Nebraska College of Law and managing partner of a law firm. Oberst was educated at St. Pius X/St. Leo School in Omaha, Nebraska, where he was in the school choir and other musical groups, and Creighton Preparatory School, also in Omaha, Nebraska. He briefly attended college at the University of Nebraska and dropped out after three semesters to tour. One night in 1992, Ted Stevens (of Mayday and Cursive) invited Oberst onstage to play. Bill Hoover, who was in attendance, invited Oberst to come back to play with him a couple of weeks later. In that short amount of time, Oberst wrote enough songs to fill out the set, establishing himself as an artist. Shortly thereafter, Oberst began committing his new repertoire to tape in his parents' basement with his father's four track cassette recorder and an acoustic guitar. In mid-1993, Oberst self-released his debut album Water on cassette tape. The release of the album was financed by his brother Justin on what they called Lumberjack Records, the indie label that would become Saddle Creek Records, making them founders and present day executives of the label. Shortly after his two solo recordings, Oberst began playing with four friends; they formed Commander Venus in mid-1995. Here's to Special Treatment was followed by 1996's The Soundtrack to My Movie, a cassette only released on Sing Eunuchs!. Kill the Monster Before It Eats Baby, a split 7" vinyl with Bill Hoover, was also released around this time. In 1994, following a Slowdown Virginia show, Oberst, along with Joel Petersen and brothers Todd Fink and Clark Baechle, formed a band called Norman Bailer, later known as The Faint. A few days later, Oberst told the other members of the band that they had a show in two weeks at Kilgore's. Despite having never performed together, they produced nine songs to perform. An album, Sine Sierra, was released (on cassette only) in 1995. Oberst formed the rock band Commander Venus in 1994 with Tim Kasher, Ben Armstrong, and Robb Nansel. They recorded two albums: Do You Feel at Home? (1995) and The Uneventful Vacation (1997). Kasher later went on to form Cursive and Nansel was the co-founder of Saddle Creek Records. Kasher left the group to focus on Cursive as they were about to go into the studio to record their second album, and was replaced by Todd Baechle. Commander Venus disbanded in 1998. The Magnetas were only active for a very brief period of time in 1996 in Omaha, Nebraska. Along with Oberst, band members included Todd Fink (The Faint) and Chris Hughes (Beep Beep). They recorded three songs, only one of which ("Anex Anex") was released on Ghostmeat Records' Parts compilation album. Two other confirmed recordings exist: "Clatter" and "Science Fiction in Schools." In January 1996, Oberst began playing drums in a group named Park Ave., alongside Clark Baechle, Jenn Bernard, Neely Jenkins (now in the band Tilly and the Wall), and Jamie Williams (also in Tilly and the Wall). The group only played between 10 and 15 shows and made a handful of recordings (several of them with Mike Mogis as producer). The group disbanded in 1998 when Williams, the singer and primary songwriter, moved to London, England. In 1999, Urinine Records released their only album, When Jamie Went to London...We Broke Up, which has also now been re-released under Team Love. Oberst founded Bright Eyes as a solo project in 1995, and after the disbanding of Commander Venus, released A Collection of Songs Written and Recorded 1995-1997 in January 1998. This was followed quickly by Letting Off the Happiness, released in November of the same year. It featured members of numerous bands and was recorded in the Oberst family basement. One year later, Bright Eyes released its first EP, Every Day and Every Night. Bright Eyes' third album, Fevers and Mirrors was released in May 2000; it was ranked 170 on Pitchfork's list of the top 200 albums of the 2000s. With the release of 2002's Lifted or The Story Is in the Soil, Keep Your Ear to the Ground, Bright Eyes received national attention and Oberst was proclaimed a breakthrough artist by several notable magazines. On January 25, 2005 Bright Eyes simultaneously released two new albums: the folk I'm Wide Awake, It's Morning and more electronic-pop Digital Ash in a Digital Urn. Time listed I'm Wide Awake, It's Morning as one of the top ten albums of 2005. The Four Winds EP was released in March 2007, followed by their seventh album, Cassadaga in April. The song Four Winds was named a top 100 song of 2007 by Rolling Stone. Oberst spent the next two years focusing on other music projects, and in June 2009 told Rolling Stone he wanted to make one final album with Bright Eyes before retiring the group. The band subsequently released The People's Key on Conor's 31st birthday, February 15, 2011. Oberst is a guitarist and singer for Desaparecidos. The music and lyrics of Desaparecidos differ greatly from Bright Eyes, having more in common with punk rock than Oberst's usual folk rock. The lyrics are generally social commentary on the state of affairs in America and the pitfalls of the suburban lifestyle, as opposed to the more introspective lyrics of Bright Eyes. Desaparecidos was active as a band between 2001–2002 but have regrouped to play shows in the Omaha area. They had two releases in 2002: a single for "The Happiest Place on Earth" and the full-length Read Music / Speak Spanish, on Saddle Creek Records. In 2012, the band regrouped and self-released the 7" single "MariKKKopa/Backsell", as well as continuing to tour. In 2013, they released two more 7"s independently, "Anonymous / The Left is Right" and "Te Amo Camila Vallejo / The Underground Man", and complimented these releases with yet another tour. In 2015, the band announced the release of a new studio album, Payola, on June 23 on Epitaph Records. On October 28, 2015, it was announced that Conor Oberst had been hospitalized due to "laryngitis, anxiety, and exhaustion," according to a press release. The entirety of Desaparecidos' remaining tour dates were cancelled and Oberst returned to his hometown of Omaha to recuperate. In November 2007, it was reported that Oberst would work on a solo record with Jake Bellows, and that he and M. Ward would start a band and perform two late December shows in Minneapolis, Minnesota. Contrary to what was believed, the shows were not played with M. Ward, but rather with Nik Freitas and Jason Boesel. They also played a show in February in Mexico City, Mexico. On March 31, 2008, it was announced that Conor Oberst would play at the 2008 Reading and Leeds Festivals. In addition, he also performed at the Electric Picnic, in County Laois, Ireland on August 31, 2008, the Cains Ballroom in Tulsa, Oklahoma and Austin City Limits in late September 2008, shows across Australia in early October 2008, and the Warfield Theater in San Francisco October 24. Conor also headlined the Friday night slot of The End of the Road Festival at the Larmer Tree Gardens in Wiltshire, held over the weekend of September 12–14, 2008. 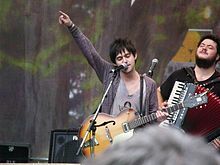 Conor Oberst released the self-titled album Conor Oberst, which was recorded in Tepoztlán, Morelos, Mexico with Taylor Hollingsworth on guitar and Macey Taylor on bass, on August 5, 2008 on Merge Records. In about mid-October, the band sold a new EP, Gentleman's Pact. It was limited to 1000 copies and was only available on tour. The band placed limitations on how many were sold at shows. It has four unreleased tracks. Three of them are pre-album songs while "Corina, Corina" is a cover of a traditional folk song. Conor and the band released their second album, Outer South, on May 5, 2009 on Merge Records. They have also released a documentary, One of My Kind, following the band from Conor's solo album to their most recent album One of My Kind. Throughout the end of 2012 and the beginning of 2013, Oberst embarked on a solo tour of North America and Europe performing with Ben Brodin on guitar and vibraphone. On the tour, he played songs from Bright Eyes, Mystic Valley Band, and Monsters of Folk as well as playing new songs. Oberst released a new solo record, titled Upside Down Mountain, on May 19, 2014. He has been working with producer Jonathan Wilson (Dawes, Father John Misty) and Swedish duo First Aid Kit. On October 14, 2016, Oberst released his seventh studio solo record, titled Ruminations, on Nonesuch Records. On January 18, 2017, Oberst announced a companion album to Ruminations, called Salutations. Oberst married Corina Figueroa Escamilla, whom he met while recording in Mexico, in 2010. His brother Matthew died suddenly in November 2016. Oberst is one of the founding members of the independent record label Saddle Creek Records, an integral part of Omaha's indie rock scene, which hosts bands such as Cursive, Desaparecidos, The Faint (who left to start their own label Blank.wav), Rilo Kiley (who left to start their own label Brute/Beaute Records), Bright Eyes, Two Gallants, Son, Ambulance, Azure Ray, The Good Life, and Sorry About Dresden, among others. Oberst co-founded the Team Love record label (along with Nate Krenkel longtime manager of Bright Eyes) to "do different things, or smaller things, that we couldn't get everyone to be into at the same time" at Saddle Creek. such as Tilly and the Wall, Willy Mason, The Felice Brothers, David Dondero, Taylor Hollingsworth and Jenny Lewis' solo album with The Watson Twins. Oberst opened Pageturners Lounge with Philip Schaffart in 2012. Located in midtown Omaha, the lounge offers good beer, good wine, and premium well drinks. The business name is a holdover from the bookstore that formerly occupied the space. Oberst was drawn to music at a very early age, due in part to his brother Matt's penchant for bands like The Smiths, R.E.M., Fugazi, and The Cure. He has cited The Cure's first singles collection, Staring at the Sea, as the first record he ever bought, as well as being one of his favorites. "It must have been third grade...I bought the cassette at a local record store chain called Homer's in Omaha. I just loved the sound of Robert Smith's voice. It just sounded good." Some of his biggest influences and favorite songwriters are local musicians David Dondero and Simon Joyner. Joyner wrote the song "Burn Rubber", which Bright Eyes covered on the "Take It Easy (Love Nothing)" single. The two used to do mini-tours together, usually on weekends due to Joyner having a family. Oberst has also been heavily influenced by the 1960s folk revival, mentioning Neil Young, Leonard Cohen, and country singers Emmylou Harris, John Prine and Townes Van Zandt. As a strong musician in the folk genre, he is sometimes considered "a new Bob Dylan." He covered Neil Young's "Out on the Weekend", collaborating with Mike Mogis, Jim James and M. Ward in concert. He performed the Townes Van Zandt song "Rex's Blues" live with fellow musician Steve Earle. He has also performed two of John Prine's songs live, "Crazy as a Loon" and "Wedding Day in Funerville". Harris sang on a few tracks on Bright Eyes' I'm Wide Awake, It's Morning. Oberst was also greatly influenced by Daniel Johnston, whose "Devil Town" was covered and featured on Noise Floor, and profoundly influenced by Elliott Smith, stating in an October 22, 2003 All Things Considered interview that, "sometimes when you're not feeling good, you have to listen to really sad music like Elliott Smith's" and that [Smith] "wrote the sweetest, saddest, most gentle songs". Oberst also said he liked to "listen to Elliott Smith's songs when he [couldn't] find anyone to talk to on the phone" and thought that it was sad that "through his music, [Smith] had the ability to answer feelings in others that he was unable to answer in himself". A live cover of Smith's "The Biggest Lie" is featured on Motion Sickness. ^ T. Cole Rachel (March 17, 2011). "Progress Report: Conor Oberst". Stereogum. ^ "Bright Eyes Biography". Rolling Stone. ^ a b Coffey, Kevin Coffey (December 8, 2016). "Coffey: Matt Oberst, 42, was a musician and friend". Omaha.com. Retrieved 2017-02-21. ^ "Bright Eyes: Carry That Weight". April 15, 2007. ^ "Conor Oberst (of Bright Eyes)". The A.V. Club. ^ Lazy-I Interview: Bright Eyes (December 1998) Retrieved on January 4, 2008. ^ McMahan, Tim (December 1998). "Growing Up in an Alt Rock World". Retrieved April 14, 2005. ^ Pitchfork staff (September 28, 2009). "The Top 200 Albums of the 2000s: 200-151". Pitchfork. Retrieved October 1, 2009. ^ Time Magazine (December 16, 2005). "Best of 2005: Music". Retrieved August 5, 2006. ^ Ryan Reed (April 6, 2015). "Conor Oberst Plots New LP With Revived Punk Band". Rolling Stone. Retrieved May 18, 2015. ^ Eric Torres (May 14, 2015). "Conor Oberst's Band Desaparecidos Announce Tour". Pitchfork. Retrieved May 18, 2015. ^ Rettig, James (2015-10-28). "Conor Oberst Hospitalized, Desaparecidos Cancel Tour". Stereogum. Retrieved 2016-08-03. ^ Hildy Johnson. "Waiting For 'Free Life'". Omaha City Weekly. Retrieved January 27, 2008. ^ Matthew Solarski (November 27, 2007). "Bright Eyes' Oberst Forms Band With M. Ward?". Pitchfork. Retrieved January 27, 2008. ^ Chris Riemenschneider (December 30, 2007). "Indie rock's Conor Oberst still bright at 400 Bar". Star Tribune. Retrieved January 27, 2008. ^ "Bright Eyes, My Morning Jacket and M Ward launch Monsters of Folk | News". Nme.Com. June 12, 2009. Retrieved August 28, 2010. ^ "Conor Oberst announces new album Upside Down Mountain and tour". Pitchfork.com. February 11, 2014. ^ Patrick Doyle (January 31, 2014). "Conor Oberst's New Morning: Bright Eyes Hits Nashville for Solo LP | Music News". Rolling Stone. Retrieved 2014-05-19. ^ "Conor Oberst's "Ruminations," New Solo Acoustic Album, Available October 14 on Nonesuch - Nonesuch Records". ^ "Conor Oberst Announces New Album "Salutations" - Conor Oberst". January 18, 2017. ^ Doyle, Patrick (January 31, 2014). "Conor Oberst's New Morning: Bright Eyes Hits Nashville for Solo LP". Rolling Stone. ^ Richard Harrington (November 18, 2005). "A Musical Vision Comes into Focus". The Washington Post. Retrieved May 23, 2007. ^ "Review: Conor Oberst-opened bar is a smart, stylish Dundee hotspot". Omaha World-Herald. April 10, 2014. Retrieved February 7, 2017. ^ RollingStone.com – Conor Oberst of Bright Eyes on the Cure's Standing on a Beach. Retrieved on January 4, 2008. ^ Comes With A Smile – Interview: Bright Eyes (Conor Oberst) by Mariko Sakamoto Retrieved on January 4, 2008. ^ Conor Oberst. "The Late Late Show with Craig Ferguson" (Interview). Interview with Craig Ferguson. ^ – The New Bob Dylan Retrieved on October 16, 2014. ^ Block, Melissa (January 14, 2005). "A Chat with Conor Oberst of Bright Eyes". ^ Singer Elliott Smith Dead in Apparent Suicide Retrieved on May 30, 2009. ^ "Conor Oberst Album Chart History: Billboard 200". Billboard. ^ "Conor Oberst Album Chart History: Billboard Rock Albums". Billboard. ^ "Conor Oberst Album Chart History: Billboard Folk Albums". Billboard. ^ "Conor Oberst". Austrian charts. ^ "Conor Oberst". Dutch charts. ^ "Conor Oberst". Swiss Charts Portal. Hung Medien. ^ "Conor Oberst". Officialcharts.com/. Official Charts Company. ^ "Upcoming Releases". Hits Daily Double. HITS Digital Ventures. Archived from the original on September 28, 2016.